Please note that the content of this book primarily consists of articles available from Wikipedia or other free sources online. 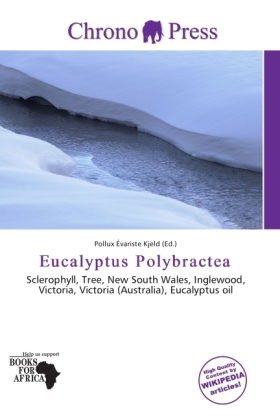 The Blue mallee, or Blue-leaved mallee (Eucalyptus polybractea) is a small multi-trunked sclerophyll tree that grows naturally in western New South Wales and the Inglewood area in Victoria, Australia. The bark is smooth, and fibrous near the trunk base. Leaves are disjunct and linear to narrow-lanceolate. Juvenile leaves are glaucous, and adult leaves grey-green. Flowers are followed by woody capsules 3-6 mm long.E. polybractea leaves are used to produce eucalyptus oil with very high levels of cineole (up to 91%), yielding 0.7-5% fresh weight overall. The oil is primarily used medicinally and for flavoring.